Seventy-six-year-old Rachel Banton died on this date, November 15th, in 1848 and was buried at Bethel Burying Ground. Seventy-six-year-old Rachel Banton died on this date, November 15th, in 1848 of “old age” and was buried at Bethel Burying Ground. I believe she was the spouse of William B. Banton. The couple likely lived with an adult married child, his or her spouse, and their two children. The 1847 African American Census reported the children were between the ages of five and fifteen years old. The Bantons reported to the 1837 African American Census taker that there was a total of five in the family who were all born in Pennsylvania. The Bantons reported they were free-born. Ms. Banton worked as a laundress and Mr. Banton as a bootblack. In the 1847 Philadelphia African American Census, he reported earning $20 a month or approximately $640 in 2018 value. In 1847, the rent for a room at 233 S. 9th Street was $5 a month or approximately $160 in 2018 value. The Bantons lived across 5th Street from what is now Independence Mall. Rachel Banton worked as a laundress. A job that taxed her body and spirit. Water had to be drawn and carried from the nearest hydrant, firewood had to be obtained, fires had to be started and heavy bundles of clothes had to be picked up and returned to her customers after the clothes and sheets were hung up, dried and folded. All this in the wilting heat and freezing cold, while taking care of children, shopping for and preparing the family’s meals, and, on occassion, while pregnant. It was an undertaking for only the strong and strong-willed. The sketch and photo below illustrate the difference between the romanticized version and the reality of a Black laundress in the 19th Century. Rachel Banton was buried at Bethel Burying Ground on a day that began “frosty” with the temperature rising to 53 degrees in the afternoon of a “fine” day. 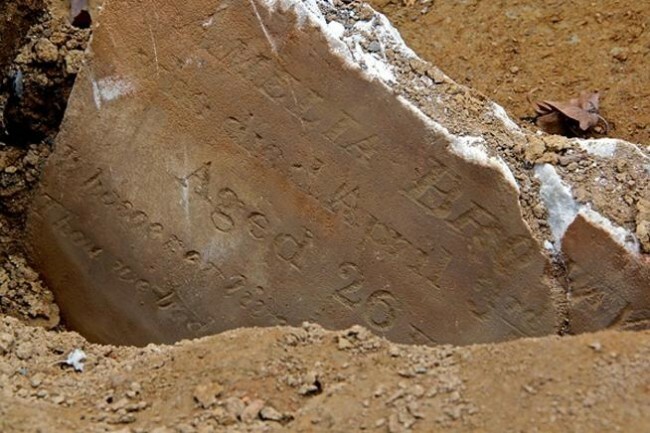 ← Seven-month-old Benjamin Wilson died this date, November 10th, in 1825 and was buried at Bethel Burying Ground.